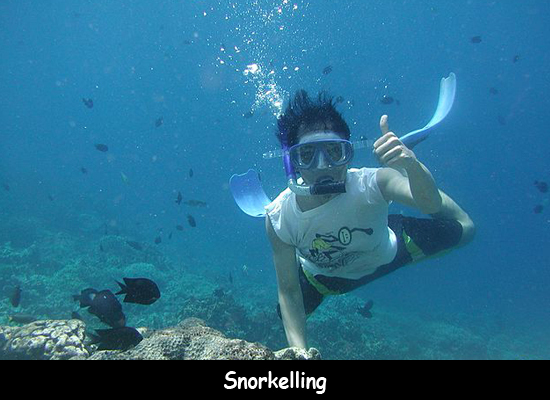 Snorkelling is a type of swimming which is done using a tube to breathe underwater. This tube is known as a snorkel and used to draw air while underwater. Ancient snorkels were made out of the hollow reeds that are common to many lakes and marsh areas. The first modern snorkel was invented by Leonardo da Vinci at a request made by the Venetian senate. It is made of rubber and is usually about one foot long and an inch in width. One end stays above the surface of water and helps oxygen to enter the lungs. Snorkelling gives the opportunity to observe underwater life in a natural setting. The term Snorkel has been derived from the German word ‘Schnorchel’, meaning air intake. Many people confuse this recreation sport with scuba diving but both of them are different. Usually, snorkelers do not have an air supply attached to their gear (oxygen tank). It is important for snorkelers to hold their breath when they go under the water. Snorkelers use a diving mask and diving fins along with a snorkel. It does not require any kind of training but practice in shallow water first with an adult. Their fins help by gently gliding and swimming under water. Breathing also becomes easier. Most snorkelers prefer to explore shallow reefs ranging from sea level 1 to 4 meters. You should remain near the surface of the water while snorkelling. If you want to go deep inside the water, you need to hold your breath. Breath holds can be significantly improved by slowing down and relaxing, practice this to improve and use a stopwatch. The air pump was invented in 1771 by a British Engineer, John Smeaten. Declan, Tobin. " Fun Snorkelling Facts for Kids ." Easy Science for Kids, Apr 2019. Web. 23 Apr 2019. < https://easyscienceforkids.com/snorkelling-facts/ >.